It would be redundant to re-tread the ground so well-covered by a fellow Observer, but I do have one or two things to contribute of my own: Specifically, one or two visual nods I picked up on, as well as the DNA of Agent Carter's ABC predecessor, Alias. The first two episodes were remarkably strong, in and of themselves. It was a handy thing, Disney owning Marvel AND ABC, so clips from Captain America: The First Avenger slipped seamlessly in as flashbacks. That's all fine. Even if I hadn't seen the picture, Agent Carter is prepped to stand well on its own two feet. One of Howard Stark's 'Bad Babies' (inventions too dangerous to fall into the wrong hands) was a formula for a powerful implosive: Molecular Nitramine. I know Spider-Man's currently covered by SONY, but these little powder kegs couldn't help but remind me of the Green Goblin's pumpkin bombs. This nitramine's the exact same size, albeit significantly more destructive. A nice visual nod to other troublesome bombs in Marvel's future (and a warning that Norman Osborn should never work with Stark Enterprises). I was especially impressed with Leet Brannis, ex-employee of Leviathan and Carter's main foil in the first two episodes. (Hi James Frain! Hi!) It's to the actor's credit that he can say more with an intimidating glare than some men do with entire monologues. Anyway: the thing I liked most about this character was his apparent standard. Every member of Leviathan has had their larynx removed, so they'll only talk to you if they deem you worthy. So who makes the cut? Not his customers, nor his colleagues at the lab. No, no. The only person Brannis will speak to (with an effectively creepy voice box) is the person he sizes up as a threat: Agent Carter. He doesn't see her for one minute before reaching into his pocket for the voice box and explaining himself. Not out of fear, the man doesn't have any. But after sizing her up, he sees her as an equal (of sorts), and therefore worthy of his time and words. High praise, in its own fashion. It may seem simple to compare one ABC spy show to another, but it's meant as a compliment. Alias aired for five years because it worked, and the writers and directors behind Agent Carter have done well to mind that. Carter and Bristow share the same mission: namely to be doubly effective in their roles as spies, by working twice as hard. Bristow worked undercover to bring down her bosses from the inside as a double agent. Carter flies under the SRR's radar because she sees things others don't, and as the only woman on the floor, she lacks, well, agency. In a different time, she wouldn't have to work under her colleagues' noses, but misogyny runs rampant, and Carter cares first and foremost about getting the job done. I really, really hope this isn't the only chance we get to see Haley Atwell in a variety of costumes and accents. She has the knack for it. Come to think of it, so did Agent Bristow. Scarcely a week went by where she didn't don a wig, tight dress, and different voice or language to infiltrate a location and get out with the MacGuffin du jour. Look at the pilot of Agent Carter! She slipped on a wig, a ballroom gown, and Knockout Lipstick to get what she was after. This scenario also involved swing dancing, avoiding plenty of cameras, and looking fabulous. Result. She did it again in episode 2 to infiltrate Daisy Clover dairy. All she needed here was a lab coat, a fake ID, and a convincing American accent. This shows her independence and resourcefulness, able to take care of business without raising too many suspicions at the home office. One thing that made Alias so great was its balance between Sydney's work life and her home life. She had friends, school troubles, actual life drama (from time to time). She hid a huge part of her life from the people she was closest to, but it didn't stop her from connecting with them. 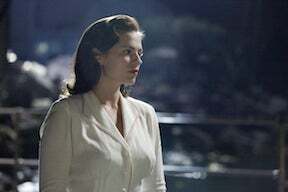 Peggy Carter's struggling here, but the efforts are noted and appreciated. She finds herself without a safe place to stay, and winds up befriending a waitress at a diner she frequents. It's not long before she's applying in the same apartment complex. Hijinks will no doubt ensue. Jarvis. The valet of Howard Stark, Edwin Jarvis is not the first character you'd think likely to follow Agent Carter into danger. I mean, yes, of course he will. But it's so unseemly! If Bristow and Carter share a flaw, it's that they can both be too self-reliant. Their caution about letting their walls down— and their need to put up a strong front— are well justified. Still. No person is an island, and these characters get unflinching support from allies they could be given to underestimate. Jarvis is that man, here. I suspect that he'll reveal greater depths over the coming weeks, but if it's not the case; if he's simply rising to the challenge because there's no one else to do it, so be it. I could think of worse allies in a pinch. Anyway! Those are my reflections on Agent Carter. It's off to a ripping start, and I heartily anticipate the next installment. What do you think?